Being captive did not suit Loki - he was a being of Chaos and Mischief. It was not his nature and as soon as he had found the slightest of cracks in his imprisonment, he wormed his way out. And done it again. And again. And again. Staying put was not his way and he did have such a delightful time sneaking out and causing mischief on Midgard. True some mortals died and others suffered because of his action but that was no skin off his back. It was simply his nature. Why should he fight it? They would not take him as their benevolent leader, so they would feel the toll of his amusement. Fortunately for the mortals, his last trip had not been so Chaotic. With an illusion left in his place, he had simply gone to Midgard, disguised as a female and spoke of himself in light tones to the children of Midgard. He could influence their minds, control how they viewed him - there was no denying that some of the views on him were very negative. He would change this view point of him. Slowly and subtly. When his plan was nearly finished, when the world was in his grasp, he would reveal himself and the mortals would have no choice but allow themselves to worship him once more. A return to the good old days. But all this could only be done in the short time that he allowed himself out. 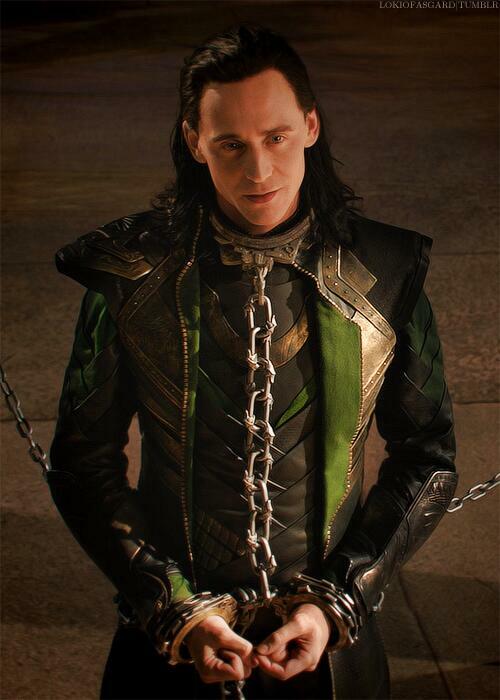 The trickster worried about being caught - it would do him no good to get put in a more Loki proof cell. He loathed the thought that he might actually be contained. So it was that only a few hours after leaving, Loki made his way back, sneaking through the pathways between realms with practiced ease. His illusion of a woman faded and as did his form as he hide himself from sight and slipped through the familiar streets and halls, all the way to the dungeons. He dipped his head, contemplating his cell for a second. There was a longing to leave and never come back but he could not risk having Asgard on his tail. And he did not want to leave his mother. She was the only vestige of his old life that remained. A silent breath left his lips and he slipped in through the dungeons, his magic hiding him from the guards as he walked past the collection of criminals and common scum that were kept here. A smile played upon his lips as he regarded their slightly crowded condition. His own imprisonment was free from the problem of having to deal with others, one of the few privileges he received due to the fact that he had bee raised as a prince of Asgard. Coming up to his cell, he raised a hand, about to perform the spell that would allow him back in when his green eyes caught the sight of a familiar figure. 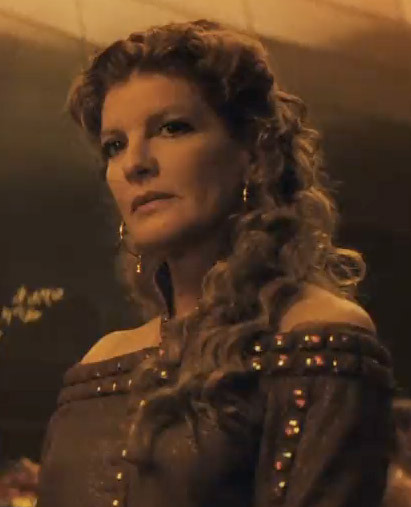 Frigga thought it about time to visit her son one evening when she was pacing the corridors, nodding in soft thought she made her way down to the dungeons. Her golden colored heels clicking soft against the rough stone floor all but announcing her decent into the darkened place. 'My queen, here to see your favorite prisoner?' One of the guards greeted her in the usual manner causing her to scowl. "Yes, I am here to visit my son. Thank you very much.." Brushing past the guards with a swish of her blue and gold dress the queen made her way to the desired holding cell. She made sure to keep plenty of books available for Loki, though it annoyed her they had to approved by Odin first. She did however cloud a few in magic so he couldn't see what a few books really were. What kind of a teacher would she be if she let her dearest student slip up in his magic studies. No harmful magic books of course, just simple parlor tricks for him to try out. Approaching the prison cell she pressed her hand against the glass with a tender smile. She could see her son inside but her sharp gaze caught the faint shimmer others might not detect. This Loki was a fake. Placing her hands on her hips the queen stared into the cell, casting a glance back towards the guards briefly before projecting herself in via illusion. Waving her hand through the fake Loki she watched it vanish before glancing around warily. "Alright, where are you?" She demanded softly into the open air, being careful not to accidentally alert the guards. She didn't want him getting caught. Pausing as his green eyes took in the sight of his mother, Loki knew that she would not be fooled unlike the guards that were meant to keep him contained. What would the situation turn to? Would she reveal his disappearances to the king? His eyes narrowed as he considered this. Was it a possibility? Features relaxed. It was unlikely. She had already risked much to keep him entertained and well. The furniture, the books... those were all thanks to her. His secret would likely be kept. So what would be the response that he would get? He frowned. Consideration lead him to believe that he probably have to face being chastened as well as a possible disappointment. It was something he could live with and he lifted his hand once more, performing the spell that let him back into the cell. Stepping in, he paused, closing it behind him. The smallest of faults in the magical walls had been all that he needed. Catching her words, Loki moved forwards, dispelling his illusion and the spell that hide him from sight. "I did not expect you. I would have prepared if you had told me you planed to visit." He said, keeping his voice neutral and calm as he spoke to his mother. He was not one to show his more caring side to others, even when that other was the woman that he had believed to be his biological mother. Walking up to her, Loki stood still, watching her, his eyes softening slightly. "What can I do for you today?" He asked, keeping his voice polite. His intent was to simply move on with the conversation before she could bring up the fact that he had left an illusion standing around in the cell. It would be preferable to simply avoid the topic. The less anyone knew about his adventures, the better. Pale hands tapped against his leg, mind racing as he thought through the possibilities. He needed to make sure that the small breach was closed to him, that he was not put in a cage he could not escape from. "It is nice to see you again," He said, his finally softening as his voice and dipping his head in a bow. Placing her hands on her hips again when he made himself visible the Queen scowled at her son. "What sort of time is this Loki? Have you always been out and about like this?" She mused and cocked her head to the side, sighing a bit. "It was not a planned visit, but it seems surprising my son will be more difficult now." Shaking her head she watched him fidget and sighed a bit, stepping closer. Forcing the illusion of herself to be solid she hugged his slender frame, feeling like an ant due to his height. "You're so very tall Loki." she mused and smiled fondly. "Have you been alright?" She fretted and immediately looked him over for injuries of any sort. Rules were made to be broken and Loki existed to be the breaker. Hence why he constantly escaped, walking on the fine line, flirting with it, indeed. A smile flickered across his face at her question. Even though he wanted to avoid this topic, it wasn't going to stop him playing around with it. "Well, it isn't like I have a bed time," He said, with a slightly smug look on his face as he worked on skirting the topic of his lack of time in his cell. Having managed a light reply to her first question, the trickster knew he would need to address the more serious question. The one that directly pointed out that he had been leaving. "I'm usually in this cell, it just gets boring after a while. I think I lasted very well considering that I don't do very well with being contained." The reply was still skimming around the truth but he saw little reason to address the full on truth. After all, she couldn't mind that much, could she? He cast his mind back to when he had first started this little game of leaving his cell. Was it about a week or two? To be fair, he didn't really bother to keep track of it. At her words about surprising him, Loki cocked his head, considering this idea. Well, it certainly was a surprise and it had caught him out. It was a good thing that he didn't get surprise visits, it seemed. "Well, it certainly is a nice surprise. I am grateful for your visit." He said, remembering to be formal and polite. His mother deserved this. It was an honour that he did not afford to many others. Eyes narrowed slightly as she made her form solid. It was something that Loki was working towards but he struggled, hence his usual use of simply illusions that held no form. They worked well for him and required less energy. He did not have long to dwell on this, though as he was soon wrapped in a hug and he moved his arms to hug his mother, resting his head against hers. There were few he would allow this close and he took a moment to simply draw what he needed from close affection from one he cared for. As she pulled away, Loki dropped his arms and smiled at the obvious concern. "I am fine mother. It would take a lot to put my in any state other than that." He assured her. She laughed softly and cheerfully replied back to him. "Oh I should give you a bedtime Loki." she "threatened" playfully and shook her head slowly. Listening to him speak she made busy by straightening up his cell and stacking books in proper places. Humming to herself she stood up fully and turned to look at him and speak once more. "I will visit more often then, if you would like that." Frigga murmured and walked closer to him again, fixing his armored attire. "I'm proud of you Loki." Her comment was soft but true just the same, she had always been proud of her sons and when Loki possessed Magic close to her own she was more than happy to train him. Of course he had progress greatly and became one of the best sorcerer's Asgard had seen in a long time. Laughing with his mother, Loki's own amusement faded rather rapidly. He rarely kept at a light emotion and laughing had become rather a foreign thing to him in recent years. "All I can do with a bed time is to defy it." He said with a smirk - even as a child he had stayed up past his bed time, reading, practicing magic, causing mischief. Green eyes followed his mother as she moved around, cleaning up his cell. As a being of Chaos, Loki was not bothered the mess and in fact preferred it that way but he would not fight his mother on the topic. He would make it messy later. It didn't really take him long to return his room to Chaos. The offer of having his mother visit was tempting and Loki nodded, intending to take her up on it. "It would be pleasant to have you visit more often although I would appreciate some warning." He said. Loki still had no intent of staying in the cell at all times but he didn't want to leave his mother here, waiting for his return. That would be impolite and as likely as not, it would get him more questions asked - he could deal without this. A small smile came across his face at the compliment his mother offered him and he looked up her. "Did you bring me any more books?" Loki asked, with some interest in his voice. He did get through the books very quickly, after all. He needed more reading material to keep him entertained during the long hours of solitude in between his mother's visits and his sneaking out. Frigga looked up at her son and offered a gentle smile. "Then I shall visit more often Loki, with warning as you so request. Shall I just pick a day to regularly visit you?" She asked, her head angling slightly with the question. The offer was to hopefully keep them both from missing one another with her queenly duties and whatever he did when leaving the prison in secret. "More books, why yes I did~" Holding her hands flat in front of her a stack of book appeared in them. Setting the books upon the table she took one from the middle and held it up. "This book is on shield projections and making an illusion of one's self more solid. Your father would be so very angry if he realized what some of the books I've brought you are. This is our little secret though, isn't it?" As she spoke she brushed her fingers over the fake title of the book so it read what the real thing was. "Practice won't you? I'm sure it will do you good to learn more defensive magic." Hearing that the Queen intended to visit more regularly brought some light to the situation. He had been staying here to avoid getting into a cell that he could not escape from. It was not enjoyable and her presence was definitely one that improved his time here. Perhaps it was one of the few reasons he stayed here, after all he could walk out, never come back and avoid being captured. It was such a tempting idea if it wouldn't keep him from his mother. "Thank you, I would much appreciate it," He said after a moment's thought on the situation. "Perhaps you could visit every Friggasday?" The suggestion was put forwards with a smile on his face. Eyes perked up as she revealed that she had brought him books, the trickster had an appetite for reading, especially when he couldn't cause mischief and the books kept him entertained. Following his mother to the table, Loki scanned through the titles, looking for any sign of illusions over them. It turned out he didn't need to as she removed a book and Loki looked at it, trying to force his eyes to ignore the illusion and see the truth behind it. Drawing in a deep breath as his mother referred to the king as his father. Anger flared in his eyes and his fists clenched slightly at this. That man was not his father, he never was. But he let it slip, this one time. "The King will hear nothing of this from me." He told her with a grin. "No secret that I wish to keep has ever passed these lips," He promised. When it came to secrets, it was best not to tell Loki yours but his own he kept sealed. "Of course I will practice. I could not neglect my studies. That would be be unpractical of me." He said with his voice soft as silk as he spoke, considering her words. Defensive... Was this her attempt to try and stop him having any more hostile take overs? Was her already too much of the offensive? His eyes searched her face, searching for an ulterior motive. Frigga thought for a moment one slender hand touching the other, blinking lightly she nodded once. "Yes.. Friggasday will do nicely son." she murmured and smiled at him, amused that he would choose her day. "Good..practice these and you're illusions will become as solid as mine. It would come in handy if you were out numbered, a few clones and the problem would go away." she mused, a glint in her eyes. Frigga is a rather skilled fighter but has never had to fight much, though that doesn't keep her from training. Glancing back to the stack of books she went over the titles in her mind, reminding herself of what he already had. "Now then, do you have any requests on books? Something particular?" she asked, always doing anything she could to make his stay in this prison better than most. The queen was most understanding with her son, unlike her husband, in what Odin called a "crime" she called ambition. He was striving to prove himself and she could see that, if only Odin wasn't so blind. The day was decided on and Loki gave a nod, feeling some relief flow into him as the situation was quickly resolved. And it seemed that he wasn't going to receive a different cell to stay in. That would have been inconvenient for him; Loki didn't want to have to find another way out. It was simpler to keep this cell and continue to use his little escape. Of course, remembering the days was not easy in here. There was no sunlight so one could not tell when night was dawning - made no easier with the constant lights. Listening carefully to his mother's words, Loki nodded. Being able to 'be' in more than one place would definitely be useful. After all, he often faced opponents that out numbered him. His mind went back to the Avengers. There had been several of them but he had an army. Yet still he had not won. He should have. The odds had been in his favour. If only that mortal, Stark, had succumbed to the power of his sceptre. He had been banking on getting on of their number to battle him. A smile played across his face as a new thought entered his mind. Perhaps he would be able to leave a clone here, a clone that appeared for all intents an purposes to be him. Then he would be able to never return to the cell. He would visit his mother, of course but not in here. At the question, Loki scanned through the list of many books he intended to read, wondering which ones he should ask for. "If you could find me one on casting runes for divination, I would appreciate it," He said. Already he was well enough versed in reading runes and their meanings, he could also as the runes questions but getting the future from them was always a more difficult task. Difficult but useful. "Also some books on controlling nature may be useful. I'm already skilled enough with mist, water," He paused, a thoughtful look entering his eyes as he considered the last thing he was going to suggest. "And ice but I would like to master other elements." Smirking as light showed in her son's eyes she realized he understood why she gave him the blood. Nodding approvingly she waved a hand, a quill and parchment showed up. The words flowed across the page marking down the books he wished to have then the paper vanished. "I will get those to you then." she murmured and glanced around the room briefly. "You'll have to work hard to train for the elements Loki, just be careful in doing so." Frigga cautioned him lightly. She wanted her son safe and knew the elements would be tricky but she also had faith in him to do well. "I am glad you're expanding your knowledge of magic. Have you anything new to show me yet?" Smiling she waited to see if he would reply and show her anything or not. Watching as the pen flew across the paper apparently unbidden, Loki was not bothered. It was a simple spell that he knew, one that he had learnt from his mother. Then the paper was gone and green eyes snapped back to the face of his mother, queen of this realm. He gave a nod at her words. "Thank you, it is much appreciated." He said politely. "When have I not been careful?" He asked, smirk on his face as he spoke. He had never injured himself while playing with the elements although others did not end up so well. He smirked and leaned back casually. He didn't want to suffer any injury himself. Others were different. He had found that he had lost some caring when it came to the lives of others. Things had changed. His eyes fell to ground as he considered this. Very few things remained stationary. He wondered whether his relationship with his mother had changed in her eyes. Whether he was a disappointment. No one really approved of his actions. "I have been mastering the ability to change my appearance. Physically and just with an illusion." He replied, eyes now focusing on his mother. Raising a brow at him she lightly set her hands upon her hips, a light smirk appearing. "When have you not been careful? Do you really want me to count the times my son." She mused and then walked towards an empty chair letting the illusion sit there. Smiling brighter now she nodded to him, urging him to show. "Well then, impress me." Crossing one leg over the other she folded her hands over her one knee and waited, watching him tentatively. Loki has always been very impressive when it came to his talent at magic, he's always excelled. A small chuckle crossed his lips as his mother's reply to his words about being careful. "Well, I suppose my current situation would suggest otherwise," He commented, green eyes casting around the cell that contained him. Well, it certainly could be said that getting in here had been part of his plan. He had desired to be ruling Midgard by this point. Still, he could spin a pretty lie into this to make it seem like it was what he intended. "Besides, who says that everything I did was not to lead me here. It's not like it's too bad in here," He commented, walking over to the small table he had and running his hand over the item of furniture. "I have you," He said, eyes rising to look at her. It was no lie. He was pleased to have time with his mother. Out of all the things he had missed about his former home, she was one of the most important things. She remained as solid as a rock in his life. The trickster wouldn't have it any other way. With the invitation to show off, the trickster smiled and performed the simple illusion of taking the form of another man. Making the change physical was not the easiest but it was something he would perfect. Then he went on to demonstrate the more difficult task of becoming someone of a different gender. He had been working on the female form. It would be useful if he needed to hide to not even be of the same gender. No one would be able to find him. With that done (all kept secret from the guards), he returned to his natural state. "Are they up to scratch?" He asked, knowing well enough that he could fool those he had met only a few times.The real question was whether it would be good enough to fool those who really knew him, like his adopted brother... Thor. Frigga smiled brightly at his words, a fond expression showing through. "Yes Loki, you do have me. I'd never abandon you. Odin doesn't know everything, magic really is very useful." She murmured and nodded. She truly did support her son, she knew the potential he had, such potential Odin often ignored in favor of Thor. While she didn't have siblings herself she knew it must have been hard for Loki, living in the shadow of his brother. Watching him change she observed the magic carefully, looking for any shimmers or anything out of place that might give it away. After a few quiet moments of observation her gaze went back to his, a smile on her lips. "You did very well, I did not notice anything out of the ordinary. The voice is one thing you may have to work on though, a disguise is one thing but if you sound wrong then all is in ruins." Nodding with her assessment she lightly reached out to touch his shoulder. "Magic is something you have a natural talent for, keep it strong." Dropping her hand she glanced towards the guards at the doors lightly, knowing she kept herself hidden with magic but still she worried. A small smile of amusement came across the trickster's lips at the queen's word. Even though she was not his mother by birth, he still loved her. Still felt as if she were his mother. It was difficult. A small part of him feared that because of their connection, his mother would be in danger (and there was the same concern for his wife) but he was too selfish to take the final act to protect them. He could not break the bonds that they had forged. Taking in his mother's suggestion, the trickster nodded and a small smirk came across his face at this. "Of course, mother," He said, changing his voice to become distinctively feminine. He was fairly good at changing his voice. It was amusing. He could do impressions if he wanted. Raising a hand to lightly touch his mother's hand, he closed his eyes and sighed. "Mother," He said softly, looking into her eyes. "What drives you to come here? I went against our views when I set out to take Midgard and slaughtered mortals. Thor and Odin do not afford me this kindness, but you do. He said softly, ever grateful for her presence but still not understanding her actions. A quiet peal of laughter left Frigga at the feminine tone from her son, the laugh was slightly echoed as both the duplicate and the castor laughed in unison. After a moment she smiled warmly at him. "Very good, top marks Loki." she praised and jokingly put a little metal star on the shoulder of his outfit. Joking aside she continued to listen to him speak, concern flickering in her eyes when he spoke seriously to her. Listening to his words she considered them for a moment and then spoke up. "Loki, you must understand that even though you are not my son by blood I raised you and taught you. You are loved. I am forbidden to see you by Odin but yet I come, risking his anger. He is foolish to deny a mother the right to see their child." Frigga murmured gently. "You've made mistakes in your ambition but we all have. I do not doubt you couldn't lead and be a wonderful king. Odin favors Thor clearly but he is blind to it himself, he never listens to me when I bring it up." Rolling her eyes in annoyance she went on. "You are worthy of such kindness and love, do not doubt that." A smile came across his face at the laughter that he had brought to his mother. It had been years since he had the chance to give others laughter, especially someone he cared about such as his mother. Green eyes were lightening and no longer full of the usual malice that seemed to have haunted them for so long. "Thank you mother," He said, giving her one of his best smiles (which also was fairly formal). His hand twitched, almost going to touch the star that she had placed there but he stopped. It had often been more important for him to keep his emotions controlled and hidden. As a second son (not even that, as he now knew) he had to be more careful about how he presented himself. Sure he had thrown that out the window with two events that could be considered as mass genocide attempts. Which had landed him here. But he didn't care about what others thought now (unless it was his wife and mother). Just some habits died hard. Listening to what his mother had to say, the man looked down and smiled. It was a smile to himself. He knew that it wasn't truly mistakes that he made. Chaos ran in his blood as did that of monsters. Those Frost Giants. He sighed and closed his eyes to keep the darker side hidden. Some things one had to keep from one's mother. "You deserve more than someone like me for a son. I've been more of a problem in recent years than most others," He said formally before summoning an emerald green rose and presenting it to her. As she left it would materialise and magic would keep it young. It was polite after all and a sign of affection. His mother deserved this for all that she had been put through by his hand.